Woe to the brown banana, thrown out at the peak of sweetness. Unappealing in appearance -- mushy and smelly but at the height of flavor like Epoisses, an artisan runny French fromage (cheese.) Flavor a dull oatmeal or punch up pancakes with this spotty over ripened fruit. 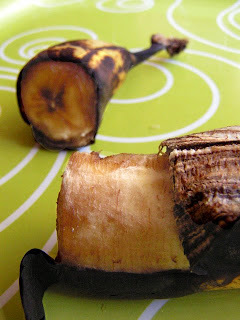 Yielding easily to a fork, a banana in this advanced maturation will mash and mix into these morning favorites. The Chef picks up bananas at his local Latin market for well under 99 cents a pound; 99c only Stores carry two-pound bags and also carry oatmeal and pancake mixes. 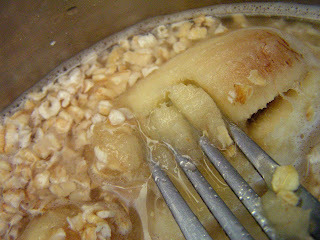 Mash 1/2 a banana into a serving of oatmeal. Follow oatmeal preparation directions, whether instant or regular. The Chef likes his steaming oatmeal topped with a slice of butter, a splash of milk and a squeeze of honey. For pancakes, mash 1 to 2 whole brown bananas into the batter, depending on how many pancakes are coming off the grill. For this politically charged election year, The 99 Cent Chef throws his whisk into the ring creating a radical salad from out of left field called Cesar Chavez Salad. Named for the great civil rights leader of California farm workers, this salad's politics are green with Salinas, CA. grown romaine lettuce and avocado in a classic Ceasar dressing shot through with spicy jalapeno to match Cesar Chavez's fiery rhetoric. 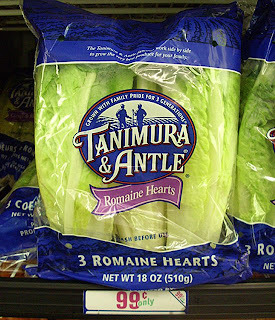 Blue State foodies will love it -- as for the rest of you, just take out the avocado and jalapeno to serve a traditional Conservative Caesar Salad. The Chef welcomes all parties to his dinner table. 2 raw egg yolks* - try discarding whites by draining between fingers; messy but quick. 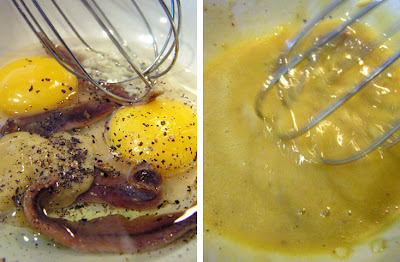 Combine olive oil blend, anchovies, egg yolks, mustard, lemon juice, and pepper; whisk until the mixture is smooth (may need to pull apart anchovies with a fork). 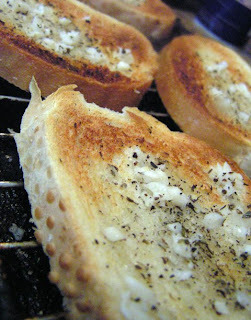 Add chopped jalapeno a little at a time while tasting to check for your "heat" tolerance. Refrigerate the dressing if you will not be using it right away. The Chef suggests caution in consuming raw eggs due to the slight risk of Salmonella or other food-borne illness. 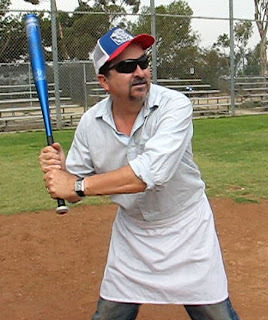 To reduce this risk, the Chef recommends you use only fresh, properly-refrigerated, clean, grade A or AA eggs with intact shells, and avoid contact between the yolks and the outer shell.Next up: The 99 Cent Chef throws a curve ball of a new video to foodie baseball fans -- featuring home runs, wild pitches, a Chicago hot dog and a "fowl" ball. When the Chef was on NBC Nightly News in June, he cooked Japanese tempura with ramen noodles for the producers and crew to film. Fresh veggies come and go at 99c only Stores, but broccoli, carrots and mushrooms are frequently stocked. Usually, tempura is served as an entree with a dipping sauce. I first had it served over ramen noodles at a favorite noodle restaurant called Atch-kotch, located in a Hollywood mini-mall . Frying vegetables in a tempura batter creates a light coating while keeping the veggies crunchy. For this recipe you can serve tempura as a side dish and use it as a sponge to soak up the miso flavored ramen broth. I also provide a traditional tempura dipping sauce recipe. 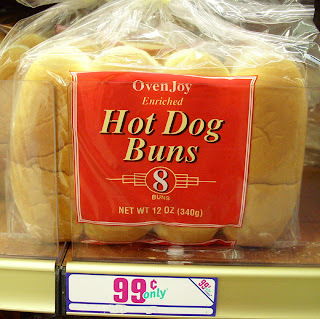 All ingredients were purchased at this 99c only Store were the "walk and talk" was filmed. My friend Drew tagged along to video the NBC interview. 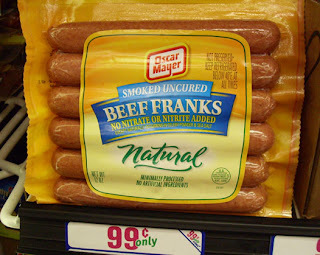 What is the saying: "You don't want to know what goes into the making of sausage?" Well, the Chef lets his audience get a glimpse into the making of his news story. So here is a short video featuring the "sausage makers." Play it here. The video runs 2 minutes 24 seconds. Heat oil to 375 degrees (medium/high heat.) Combine tempura batter ingredients; should be consistancy of pancake batter. Clean and dry vegetables. 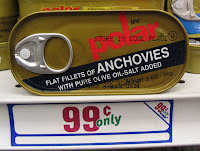 Pat dry fish filets. Coat vegetables with batter and fry (in batches if necessary.) Batter and fry fish last. Frying should be 5 - 8 minutes for each batch; tempura batter does not need to brown like a typical fry, just enough to cook vegetables but still be crunchy. While tempura is frying prepare ramen per package directions. 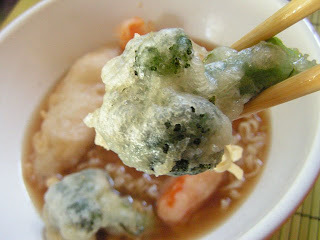 Serve ramen with broth; top with vegetable and fish tempura. Put tempura dipping sauce in a shallow bowl for extra dipping flavor. 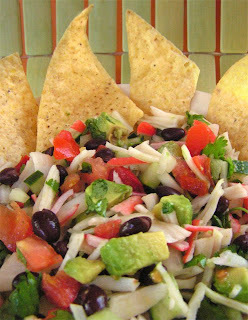 for a hot summer day is the 99 Cent Chef's ceviche with black beans. There are a hundred variations of ceviche and the Chef has tried quite a few - from bland American "Acapulco" chain restaurant style with semi-frozen shrimp; or L.A. San Fernando Valley taco truck "lime cooked" minced fish and onion on a crispy tostada round; to a just-across-the -border scary Tijuana fresh clam ceviche from a local street vendor using "cleaned" clams with juice, chopped onion, lime, and plain ketchup with salsa picante - it's actually quite delicious when chased with a cold Corona. The Chef hits his local Latin market for most ceviche ingredients. 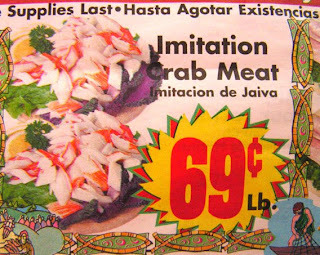 Seafood is expensive so the Chef keeps a lookout for sales on imitation crab, often for 99c or less a pound. The Chef is a fan of imitation crab or Krab. It is firm and shreds easily. Other Latin market ingredients include: cilantro, tomatoes, cucumber, onion and avocado; all cost well under 99c, although for some reason their canned black beans and tortilla chips are over a dollar - 99c only Stores stock those. A few years ago the Chef started adding black beans and cucumber to his ceviche; the cucumber brings an extra cool crunch and black beans add extra protein and texture (for a vegetarian version leave out the Krab.) So sharpen your knife and chop up a summer ceviche. In a large bowl combine beans and chopped veggies (except avocado), and mix well. 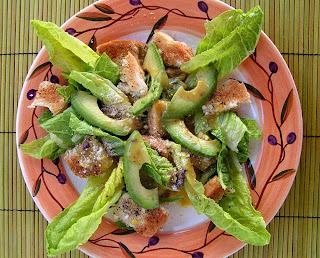 Add lime juice, then add avocado last, as it tends to get mushy, and mix lightly. 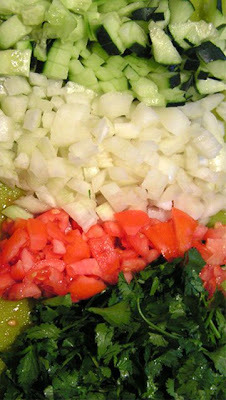 I hope your knife is sharp -- this recipe involves a lot of chopping. Chill ceviche for an hour, if you can resist dipping in. This is a great patio party dish. Serve with tortilla chips, hot sauce, and ice cold cerveza. 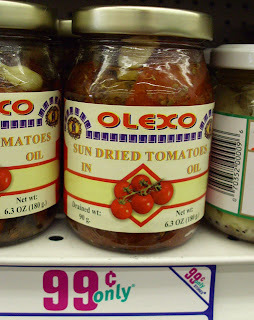 Sundried tomatoes in oil were one of the earliest great deals the Chef found at 99c only Stores. Buying 6 jars at a time the Chef used them in every dish he could think of -- stuffed into a buttered baked potato, sliced and sprinkled over a salad, liberally distributed in every type of pasta dish, and lastly sauteed with scrambled eggs. The oil is infused with a concentrated tomato flavor, plus it keeps the eggs from sticking to your frying pan. 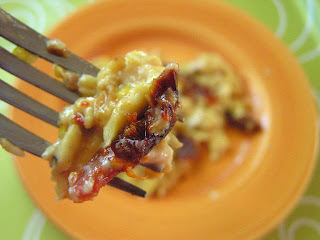 Just start by heating up a few pieces of sundried tomato; then make your favorite scrambled eggs. Eggs are a great vehicle to try out an ingredient you may not be familiar with. If you're not sure what a particular herb tastes like cooked, just add a pinch to a quick one egg scramble. Egg prices are currently all over the map. Last month, 99c only Store egg prices fluctuated from 99c a dozen to 79c cents for half a dozen. 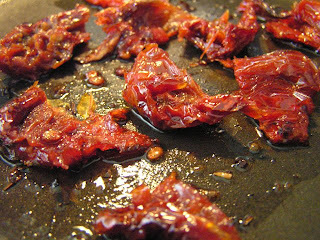 Heat sundried tomato halves for a couple of minutes over a medium heat and break apart as they get softer. 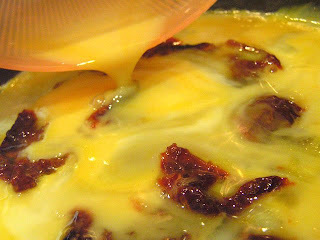 Prepare eggs for your favorite scramble and add in the pan, mixing with sundried tomatoes. Cook until eggs are as firm as you like.